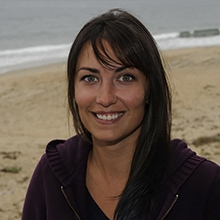 Jacki Long is a research technician in the Marine Biogeochemistry Group led by Andrea Fassbender. Jacki earned her B.S. (2011) in physics from Florida State University. She then went on to complete her M.S. (2013) in marine science from the University of South Florida, College of Marine Sciences where she worked as a graduate research assistant in the Remote Sensing and Optical Oceanography Laboratory. Jacki’s research interests focus on using in situ and remote sensing methods to better understand ocean biogeochemical carbon cycling.